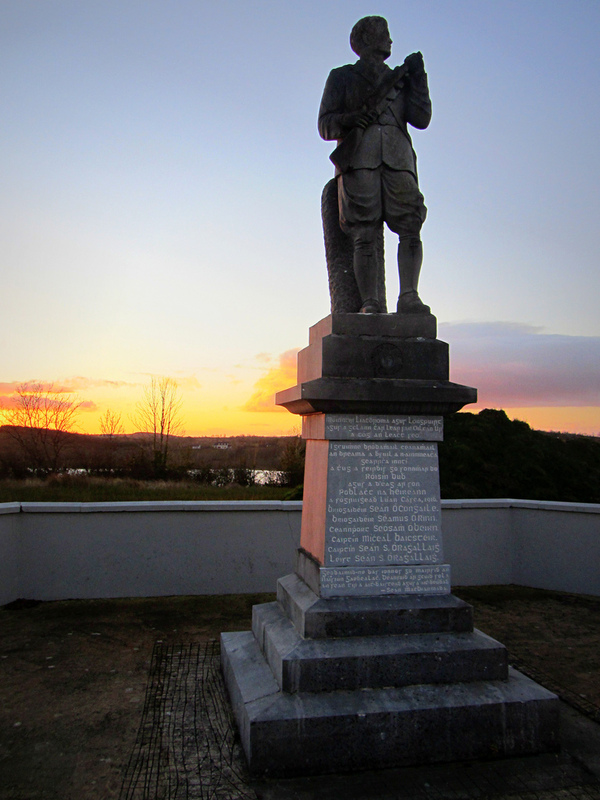 The Selton Hill Ambush took place on 11 March 1921, during the Irish War of Independence. The windows of the cottage imploded as a hail of bullets cut through the building. The crash of shattered glass and the splintering of the wooden frames alerted those within that a full scale attack was under way. Masonry and plaster dust engulfed the small rooms as bullets chipped and pock marked the interior. Those within the cottage crouched low, unable to return the fire of their attackers. Commandant Séan Connolly of the Irish Republican Army knew his position had been compromised. He ordered his men to make ready to egress from the building. He knew his unit faced certain death at Selton Hill. Located in County Leitrim, Selton Hill was the setting for an Irish Republican Army training camp during the Spring of 1921. Commandant Séan Connolly, a staff officer from Republican Headquarters was selected to raise and train, in guerrilla warfare, a number of Flying Columns. Though originally from County Longford, Connolly was ordered to establish armed resistance units first in County Roscommon and then in County Leitrim. At the same time as giving him the order, Michael Collins warned the officer that it was ‘the most treacherous county in Ireland. On the journey to Selton Hill, Connolly had reconnoitered the area near Ballinamore in order to locate suitable enemy targets for future operations. A week previously, on the 4th March, the South Leitrim Brigade had engaged British Forces at Sheemore, inflicting heavy casualties and Connolly wanted, once again, to execute a successful operation against the enemy. Early in the morning of 11th March 1921, Commandant Connolly and his section arrived in the house of James Flynn, a sympathizer to the cause. His unit consisted of Captain John J. O’ Reilly, Seamus Rynn, John O’ Reilly, Michael Baxter, Joe Beirne, Jack Hunt, Bernie Sweeney, Andy MacPartland, Paddy Guckian and Pee McDermott. They had been traveling since 05.00 hours and in order to avoid British patrols had marched across country from Egan’s of Corlasko, Eslin Bridge and on to Selton Hill. Flynn’s residence was situated near a house owned by a Protestant family named McCullough. Two local Volunteers, Frank and William Murphy, advised Connolly of the dangerous location of both houses, their close proximity to Protestant landowners and the possibility of being seen in the locality by police informers. A local member of the Cumann na mBan, Delia Mannion, also heard of the columns location in the area from careless talk in the local shop. Word was sent to Commandant Connolly of the danger of staying at Flynn’s house, but the officer ignored the warnings and decided to remain. Volunteers Paddy Guckian and Pee McDermot were posted as sentries in the McCullough residence near to where the men were billeting. From this position they could watch the approach road. Exhausted from the journey, the Column settled down for some rest and something to eat. Unknown to Commandant Connolly, his arrival in Selton Hill had been detected by a local member of the Orange Order, William Lattimar, who relayed the information to a local doctor, Dr Charles Pentland, an ex-British army officer. A message was dispatched to R.I.C. District Inspector (D.I.) Thomas Gore Hickman at Mohill, who immediately notified the military in Boyle, County Roscommon where a platoon of British soldiers from the Bedfordshire Regiment was immediately dispatched in order to intercept the republican group. At 16.00 hours, British soldiers debussed from their vehicles on the main Selton to Mohill road near the target house. The officer in command deployed two sections with Lewis machine guns to cover the front of the building. These squad automatic weapons were light weight (12.7kg) and were capable of firing 550 rounds per minute. A third section was ordered to outflank the building by using the lane adjacent to the house. The fourth section was to provide over watch. The British soldiers moved into the lane but were spotted by the son of James Flynn, schoolmaster Charlie Flynn, who signaled a warning to the Volunteers in the house. The warning had come too late as the Lewis gunners unleashed a barrage of machine gun fire on the house. Commandant Connolly knew the situation was critical and shouted to his men to get out through the back door. Leaving a rear guard to cover their retreat, the Volunteers ran outside. The British were in position and awaiting the fleeing Unit. Volunteer Jack Hunt who had been visiting the sentry post at McCullough’s and was returning to report to Connolly, was caught in the open, shot and seriously wounded. As the group ran, British soldiers opened fire. Pulling back the bolts on their rifles, brass cartridge cases spun from the breeches, the soldiers sliding the bolts forward to chamber another round. A running gun battle ensued with the Volunteers returning fire on their attackers. As Commandant Connolly moved out from the cover of the house he was hit by a volley of rifle fire and mortally wounded. Volunteers Seamus Rynn and John O’ Reilly were shot dead as they also tried to escape the torrent of rifle fire. In an attempt to stop the military outflanking their position Captain John Joe O’ Reilly prepared to throw a hand grenade but was shot simultaneously and the grenade exploded in his grasp, blowing off a portion of his head and face. The rear guard in the cottage engaged the machine gunners as they changed magazines on their weapons. However, the automatic fire was so intense that it was decided to make a run for it. Volunteer Andy MacPartland succeeded in running through the gun fire and escaped capture. With the military now advancing on their position, Volunteers Joe Beirne, Michael Baxter and Bernie Sweeney made a desperate break for it. A burst of machine gun fire cut down the group, killing Beirne and Baxter and seriously wounding Sweeney in the groin. As Sweeny tried to stand up, he was hit again in the leg and collapsed into a drainage ditch. Water covered his body and his head was hidden from view by a bunch of rushes. A search of the area failed to locate Sweeney who was later rescued from the ditch by fellow Volunteers and conveyed to Ballyduff where he received medical attention from Dr. Dolan of Ballinamore. The sentries at McCullough’s house, Paddy Guckian and Pee McDermott evaded capture by heading to the edge of Selton Lake and then on to Drumany. The wounded Jack Hunt and Charlie Flynn were placed under guard in one of the lorries along with the dead who had been wrapped in blankets. Commandant Sean Connolly who had been mortally wounded was also placed in the lorry but was to succumb to his wounds in Carrick-on-Shannon military barracks later that night. British forces did not suffer any casualties in the gun battle. The I.R.A. later discovered that their position had been compromised by a local doctor and farmer. Two weeks later, the IRA executed William Lattimar for his part in informing on the Column. Dr. Charles Pertland, the ex-British army officer who assisted Lattimar, evaded the hit squad sent to kill him and fled to England. In 1925 he was killed in an accident in London when a lorry mounted the pavement and crushed the doctor to death. As the Irish War of Independence progressed, the security of Flying Columns and training exercises were to be continually compromised by loyalists and informers.